Scott is increasingly in demand at guitar workshops and clinics, and has been performing lately in a trio with John Reischman and Sharon Gilchrist. He also occasionally performs in a duo with mandolinist Joe K. Walsh, as well as occasional gigs with Bay Area musicians like Alisa Rose, Jesse Appelman, Jody Stecher, and others. His band Scott Nygaard and Crow Molly is on hiatus. The acoustic power trio of mandolinist John Reischman, guitarist Scott Nygaard, and bassist/mandolinist Sharon Gilchrist blends traditional bluegrass and folk styles with their own personalized visions of contemporary acoustic music, reshaping old melodies and composing new music based on traditional forms with an improvisatory flair and melodic richness. Reischman and Nygaard, both Grammy winners revered in the acoustic world for their melodic virtuosity and impeccable tone, have been performing together off and on since the early ‘90s, when they played on each others’ solo recording debuts for Rounder Records. 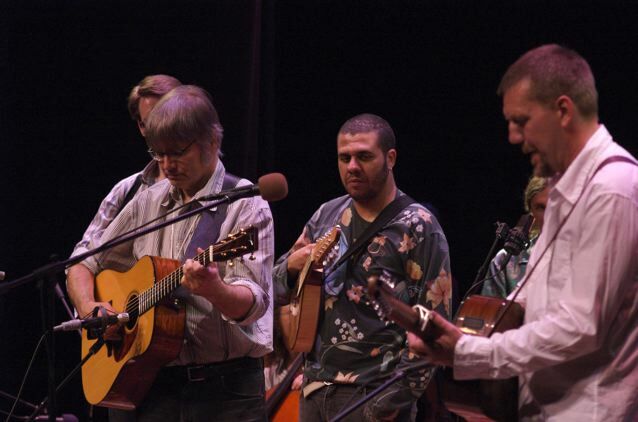 They are joined by Gilchrist, whose mandolin and bass playing have been in high demand for years, gracing the bands of acoustic and bluegrass icons Darol Anger, Peter Rowan, Tony Rice, Laurie Lewis, and others. Reischman’s most recent album, Walk Along John,was described by Bluegrass Today as combining “blazing bluegrass, stately old time melodies, and even reckless, seat-of-the-pants improvgrass,” a fitting description of what you can expect to hear from these three empathetic musicians. 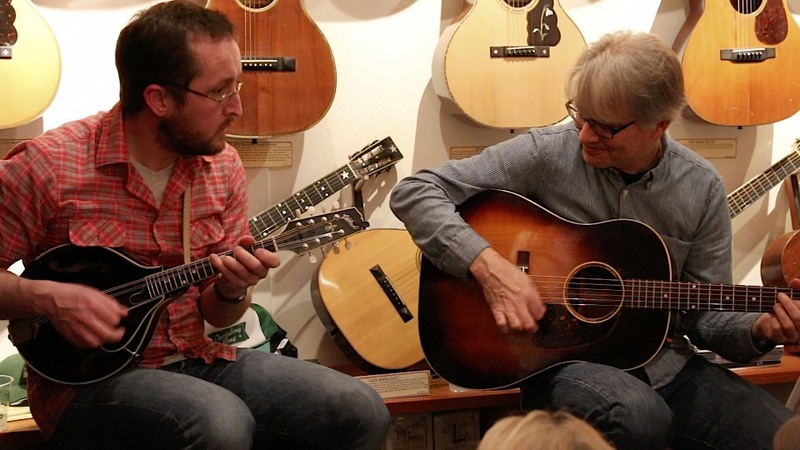 Scott Nygaard and Joe Walsh have a passion for roots music that transcends genre labels. With playing that is distinctly original yet informed by the string band traditions of bluegrass, old-time, swing, Celtic and more, their music takes on qualities that link generations yet go beyond them. Their borders are timeless—music limned not by age but by creativity and discipline. Joe and Scott first collaborated in Scott’s band Crow Molly (with fiddler Lauren Rioux), which was documented on the self-titled 2005 album Scott Nygaard and Crow Molly. Since then Joe has made a name for himself in the acoustic music world with award-winning bluegrass superstars the Gibson Brothers, helped found the indie pop-grass group Joy Kills Sorrow, and currently can be heard with Darol Anger’s new acoustic quartet Mr. Sun. He has recorded two solo CDs and teaches mandolin at the Berklee College of Music. Scott and Joe’s music is diverse yet unified by their preternatural musical instincts that border on the telepathic. Whether trading turns on a traditional fiddle tune, collaborating on an off-the-cuff arrangement of one of their original pieces, singing a Hank Williams or Bob Dylan classic, or flashing out on a virtuoso rendition of a bluegrass standard, their music is fresh, exciting, and spontaneous, the product of two sympathetic musical minds and friends. Scott Nygaard and Crow Molly, an exciting new addition to the contemporary string band scene, is the result of a collaboration between Grammy-winning guitarist Scott Nygaard and young string virtuosos Joe Walsh (mandolin) and Lauren Rioux (violin). Designed to showcase Nygaard’s original material, a unique and seamless blend of bluegrass and jazz with Celtic and Scandinavian folk influences, the trio has created, an infectious, melodic sound that will appeal to Celtic, folk, and bluegrass audiences as well as open-eared fans of contemporary acoustic instrumental music. Many years ago, in the early ‘90s, I began discovering some of the great music being produced by the contemporary Nordic music scene. The tunes that stuck in my head usually seemed to emanate from the amazing Swedish group Vasen. Years later, after somehow acquiring a very basic understanding of the polska, I finally met Vasen’s guitarist, Roger Tallroth, who by that time had become one of my favorite guitarists. We were enlisted to play a short guitar duet to begin a festival-closing version of Roger’s iconic “Josefin’s Waltz,” and after running through “Josefin’s” and a few other tunes to get musically acquainted, we knew we’d have no trouble making music together. In fact, we both returned from that festival to our separate homes (San Francisco, California, and Uppsala, Sweden) with the same idea: we should do that again, maybe with a recording device running. We got together on Vasen’s next tour of the US, and while discovering that we shared a love of strong coffee and buttery pastries as well as strong melody, forward-moving polyrhythms, and buttery harmonies, we became fast friends. Neither Roger nor I have been particularly interested in “guitar music,” preferring to spend most of our musical lives in bands and the company of other stringed instruments and vocalists, so we enlisted the help of Swedish/English fiddler Emma Reid on a number of tunes. As you will hear, she took to this guitary multi-continental music with panache and aplomb. So I saw a show – Charlie Daniels Band at Billy Bob’s. The Guitar player looked a lot like you. Am I right or wrong? Reading your articles for several years,in acoustic guitar-Another side of Scott Nygaard!